Spectacular skyline views, handcrafted cocktails, and the luxury of one of Brooklyn’s buzziest new hotels. 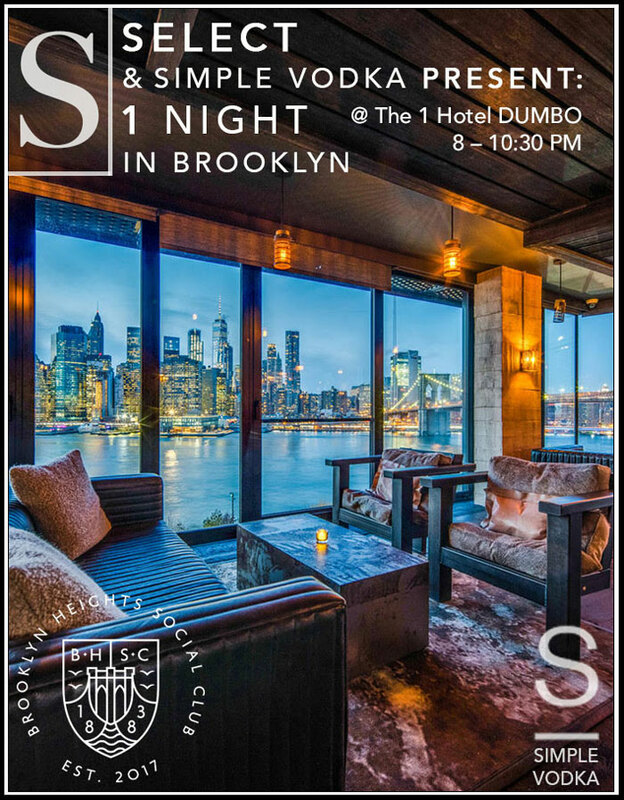 Join us for a special Brooklyn edition of SELECT Social Night, as we team up with Brooklyn Heights Social Club and gather within the gorgeous 1 hotel, to mix, mingle, and enjoy a few cocktails among friends. Starting from 8pm, Members and their guests are invited to enjoy unlimited quantities of Simple Vodka's specialty cocktail, The Brooklyn Red for a full two and a half hours until 10:30pm. Don't miss this opportunity to experience one of the most anticipated NYC hotel openings in years while overlooking DUMBO's exclusive view of the Manhattan skyline. Come early, but make sure to stay late – and enjoy beats from a live DJ starting at 10pm and going throughout the night. For those Members really wanting to paint the town red, inquire about their special rates for SELECT Member table bookings. This Social Night will be free for Members and a preferred guest, with further guest tickets available for $15.